The NFL has announced the preseason opponents for all teams, and some game dates. The Steelers will host the Arizona Cardinals in their preseason opener on August 13. That game will be televised by ESPN. The dates for the remaining preseason games that Pittsburgh will play remain to be set; however they will play at Washington (sometime between August 20 - August 24), then host Buffalo (sometime between August 27 - 31), and finish up the preseason at Carolina (most likely September 3). With the awarding of 32 compensatory picks (more on that later) the order of the 2009 NFL Draft is now set. The Steelers will have picks 32 (first round), 64 (second round), 96 (third round), 132 (fourth round), 168 and 169 (final two choices of round five), 205 (end of round six), 226 (seventh round choice received from Tampa Bay in the Sean Mayhan trade), and 241 (seventh round). "NFL owners have passed four player safety rules for next season. One of them is the elimination of blindside helmet-to-helmet blocks. The changes came Tuesday at the NFL meetings in California. The new rules state that the initial force of a blindside block can't be delivered by a helmet, forearm or shoulder to an opponent's head or neck. An illegal blindside block will bring a 15-yard penalty. Initial contact to the head of a defenseless receiver also will draw a 15-yard penalty. On kickoffs, no blocking wedge of more than two players will be allowed. Also, the kicking team can't have more than five players bunched together pursuing an onside kick." Rich McKay met with the media a few days ago to outline proposals that will be forthcoming from the Competition Committee, and we thought you might be interested to see what is being discussed. Bunch formations on kickoffs: Since requiring kickoff teams to keep a minimum number of players on one side of the kickoff formation teams have moved increasingly to grouping players in a tight bunch inside the hash marks in an attempt to disguise what its intentions were. The proposal would require teams to line up in a more easily discernible formation. Reduce the number of players in the wedge: According to Mr. McKay some teams use three or four players in the wedge when returning kicks. Mr. McKay told the media that some teams do not use a wedge at all, therefore three or more players in that role "will [not] adversely affect kickoffs." We're not sure of the logic there, but that is what he said. The Hines Ward Rule: Technically this rule would ban blocking defenders in the head, but the hit by Hines Ward on Cincinnati Linebacker Keith Rivers seems to be the impetus for this proposal. No hits to the head of a receiver who has not yet received the ball: In this proposal no defender could hit a receiver in the "head area of the defenseless receiver" ~ i.e. a receiver who has not caught the ball. Mr. McKay indicated that a defender would not be permitted to "hit that receiver with your forearm or with your shoulder as that receiver has yet to catch the ball. In other words, have two feet on the ground with possession of the ball." This may be a result, in part, of Ryan Clark's wicked hit on Wes Welker last season. Expanded Instant Replay: Two specific types of plays would become reviewable ~ "an incomplete pass where there is a recovery of a fumble," which would allow the play to continue (i.e. the fumble recovery would play out) and then provide for a review/challenge, and "a loose ball being out of bounds when it's recovered on the field of play." Mr. McKay referred to "a couple of kick plays where the ball landed right by the sidelines" as the impetus for that change. No onside re-kicks: Currently the rule is that a foul on the kicking team during an onside kick does not result in a rekick. This proposal would extend that rule to the entirety of the game. Changes that are adopted should be announced in the next day or two. We have to admit to a little disappointment. The NFL Owner's meetings are being held in Dana Point, California; and to say that the location of those meetings is close to home would be an understatement ~ indeed the hotel where the meetings are at is a stopping point for our weekend bike ride. But the league turned down our credential request (it is hard to blame them ~ you have seen this blog, do you think of us as "media"? ), so we are relying on the usual suspects for our information ~ just like you. The folks at Pro Football Weekly are predicting big changes including a shift in when the draft is held which in turn would alter the college all-star games (e.g. the Senior Bowl) and the Combine. All of that is well-and-good, but what concerns those of us who love the game (both during the season and the off-season) is a desire amongst league leaders to "create a lengthy break from league business — allowing for ample downtime in May and June." One can only hope that such a reconfiguration of the off-season would improve the potential for an additional game (or two) to the regular season ~ anything to breakup the monotony! Perhaps we are making too much of this, but the announcement today that Steelers owner Dan Rooney has been chosen to be the U.S. ambassador to Ireland seems like a pretty big deal for the people of Pittsburgh, and Steelers fans everywhere. As season ticket holders we are just wondering whether or not we could drop in on the Ambassador when/if we make it over to the Emerald Isle? The day job is unexpectedly heating up, and as a result it is a bit tougher than usual to keep the entertaining and illuminating postings rolling. Things should be closer to normal next week ~ we did just receive the invoice for our 2009 regular season tickets (it looks as though there is no price hike in our level of seats, the first time that has happen in the five seasons we have had the tickets) ~ so hang in there for a little bit longer! We do not know if Steelers running back coach Kirby Wilson attended Ben Roethlisberger's recent birthday soiree in Las Vegas, but he reportedly was in town recently to attend UNLV's pro day ~ and apparently saw a tremendous performance Frank Summers. Mr. Summers, a running back for the Rebels, suffered a knee injury in a game last season versus San Diego State; and perhaps as a result of that was not invited to the NFL Combine. According to an article in the Las Vegas Sun Mr. Summers put on quite a show running a 4.55 40-yard dash (which would have been eighth best at the Combine), a 34.5 inch vertical jump (outside of the top ten), and 30 repetitions in the bench press (225 pounds, would have been tied for first at the Combine). According to the article one scout described Mr. Summers as "a junior Bus." Late round pick? Undrafted free agent? Time will surely tell. Is Bryant McFadden Returning to Pittsburgh? In an article in today's Pittsburgh Post-Gazette Ed Bouchette discusses the relative lack of activity by the Steelers in the free agent market. But we are beginning to wonder if there are not some things in the works that could bubble to the surface in the next couple of weeks. What piqued our interest is the NFL's official list of free agent signings; more accurately what piqued our interest is who is not on the list ~ Chris Kemoeatu. Like nearly everyone we were thrilled to hear of Mr. Kemoeatu's return to Pittsburgh however no such signing has been reported to the league office (as of 3/4/09). Indeed, the only official signing that has occurred in Pittsburgh is the re-signing of Sean McHugh which was reported on March 2. As Mr. Bouchette points out in his article negotiations with James Harrison's agent are still ongoing, as are negotiations with the agent for Max Starks. The signing of more cap-friendly contracts by those two players, along with free agent signings in Arizona (i.e. Kurt Warner) and Detroit (i.e. cornerback Phillip Buchanon and running back Maurice Morris) ~ two teams that are perceived, along with the Steelers, as being most interested in Mr. McFadden's services ~ may be creating some downward pressure on Mr. McFadden's negotiating position. Stated as a question, is the market for Bryant McFadden breaking the Steelers' way? Of course it could also be possible that more cap-friendly contracts for current players may be required in order to re-sign Mr. Kemoeatu ~ but we like Mr. McFadden and are trying to keep hope alive. We press on with our look at the performance of the Pittsburgh offense on a down-by-down basis with an examination of third down. 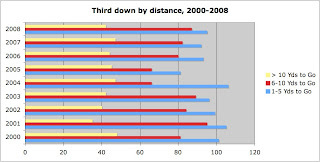 As you may recall, the 2008 performance of the offense on downs one and two was pretty poor; so what did that mean, overall, for the offense? The numbers never lie ~ while the number of short-yardage plays was far from its highest level (i.e. 106 in 2004) there was a slight improvement over 2007. Of more interest is the fact that the four seasons in which the offense has had the fewest third-and-shorts have been the past four seasons. Clearly this past seasons's early down struggles were no anomaly. On the other hand the number of "third-and-who-are-we-kidding" plays (i.e. more than ten yards needed) was at its lowest point since 20003 (also 42), and was tied for the third lowest total of the past nine seasons. A pretty unique "pattern" emerges, one that has involved a couple of two year trends (downward in 2001 and 2002, upward in 2006 and 2007) and some swings back-and-forth in-between. 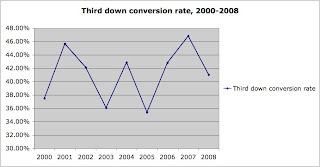 Coincidentally, in the four most recent seasons the two that saw the worst third down conversion rate were 2005 and 2008 ~ seasons that saw the Steelers win the Super Bowl. The St. Petersburg Times is reporting that one of the four missing men has been found alive, and is now at Tampa General Hospital. Bay9 News in Tampa is reporting that the missing boat was owned by Marquis Cooper, not Corey Smith as was previously reported by the Associated Press, and "was about 50 miles out in the Gulf [of Mexico]." There is no indication in the Bay 9 report as to the source of that information. Their report goes on to say that inclement weather is hindering the search. Watchstanders at Coast Guard Sector St. Petersburg, Fla., received a call at about 1: 30 a.m., Sunday, reporting that four friends, Victor "Marquis" Cooper, Nick Skyler, Corey Smith and William Bleakley did not return from their fishing trip as expected. The four boaters left at about 6:30 a.m., Saturday, from the Seminole Boat Ramp in Clearwater Pass, in a 21-foot center console boat. A Coast Guard 47-foot motor-life boat crew from Station Sand Key, Fla., HH-60 Jayhawk helicopter and C-130 Hercules fixed-wing aircrews from Coast Guard Air Station Clearwater, and the Coast Guard Cutter Crocodile are searching a 750-square mile area west of Clearwater Pass for the missing boaters. An Urgent Mariner Information Broadcast (UMIB) is also being transmitted on marine VHF radio channel 16. If anyone has any information regarding this case they are asked to call Coast Guard Sector St. Petersburg at or by marine VHF radio channel 16. Former Pittsburgh Steelers linebacker Marquis Cooper, who may be best remembered in Pittsburgh for wearing jersey number 55 following the departure of Joey Porter in 2007, is reportedly missing at sea. A report from the Associated Press indicates that Mr. Cooper and Corey Smith, a defensive end with the Detroit Lions, left Saturday morning aboard Mr. Smith's 21-foot boat on a fishing trip. The two were expected to return the same day but did not, and have not been heard from. According to the same report the Coast Guard is searching a 750 square mile area for the two. During two separate stints in Pittsburgh Mr. Cooper played in five games. Last season he played in eight games for the Oakland Raiders.